CMH Pre-Hospital Services operates Emergency Medical Services (EMS) in three counties (Cedar, Hickory, and Polk) from four stations with eleven ambulances and approximately 60 employees. Mobile-enabled website developed for EMS professionals in SW Missouri. Regional resource for EMS classes and events in SW Missouri. CMH EMS Protocols (version 4) dated 4/1/15. Field Training Officers (FTOs) are utilized to educate and orient new employees and students riding on an ambulance for CMH. All observers, students, and new hires riding as a third rider must be riding with an approved FTO. Ride schedule must be authorized prior to riding. Once authorized and scheduled, your email will be replied to with confirmation and the FTO name you will be riding with. The FTO will be copied in on the confirmation email. To schedule clinical time in the ER, please send an email to shirley.westmark@citizensmemorial.com. Field Training Officers (FTOs) are utilized to educate and orient new employees and students riding on an ambulance for CMH. All observers, students, and new hires riding as a third rider must be riding with an approved FTO. 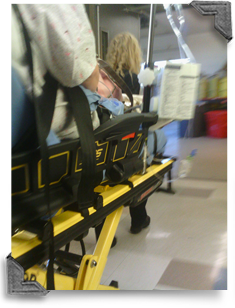 To ride on an ambulance (observer, student, orientation), the following rules apply: Rider must ride with approved FTO, All riders must have CMH-issued ID (temporary from HR or employee ID), Riders must conform to their class uniform policy or BDU-style dark blue/black pants and a dark blue t-shirt, A maximum of one rider per shift per ambulance, Shift must be no less than four (4) hours and no more than 16 hours long, Bolivar shift times must be between the hours of 7am and midnight (new hire exceptions may exist), Cedar and Hickory shift times must be between the hours of 8am and 8pm (student may be able to stay as late as midnight with the permission of the FTO) (new hire exceptions may exist), It is strongly preferred that the student shift starts at the beginning of the ambulance shift, All shifts must start and end at the station (ambulance may not pickup a rider or drop off a rider at any other location), Rider should arrive 15min early and be prepared to get off late, During the shift, the rider cannot move from ambulance-to-ambulance unless they will always be riding with an appropriate FTO and all FTOs approve, Ride schedule must be authorized prior to riding. To be authorized and scheduled: Select date and shift: Bolivar shifts: A shift: 7 am to 7 pm B shift: 8 am to 8 pm C shift: 10 am to 10 pm 24-hour stations (Hermitage, Stockton, Eldorado, Osceola): All shifts start at 8 am Send a request email with 24-hours notice to theron.becker@citizensmemorial.com Once authorized and scheduled, your email will be replied to with confirmation and the FTO name you will be riding with. The FTO will be copied in on the confirmation email. Emergency Room Clinicals To schedule clinical time in the ER, please send an email to shirley.westmark@citizensmemorial.com.